When an opponent plays a card, you may discard a card that shares a type with that card to gain 1 action token. 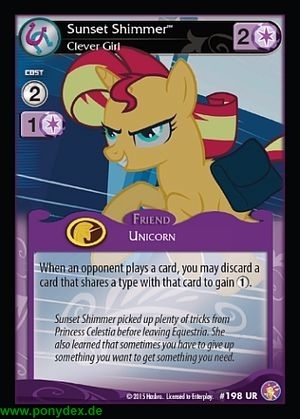 Sunset Shimmer picked up plenty of tricks from Princess Celestia before leaving Equestria. She also learned that sometimes you have to give up something you want to get something you need.